Coco&Me » Blog Archive » Spring! The day the sky turned blue. Midday at the market, for a moment, the clouds subsided & the sky turned beautiful blue. It prompted me to ask my fellow stall holder to look after my stuff & go for a quick stroll. We often take turns looking after each other’s stalls like that, for whenever nature calls or when we need to grab ourselves a lunch. When on my stroll, I often like to walk to the end of the market to see my friends at their baguette stall. On way, I noticed the cherry tree next to ‘L’eau à la bouche’ café was in full bloom. Wow, first sign of Spring & what a magnificent one! Mr.S from the café says that it bloomed almost all of a sudden. I took the murky picture above with my grubby iPhone. The weak but direct ray from the sun felt penetrating & tingling warm in the still crisp cold air. Perhaps the cherry tree decided to make the most of the sun’s rays & use the opportunity to blossom, just like how it prompted my little stroll. I felt peaceful. Or maybe I was just simply spaced out through lack of sleep. I went to bed after 4am on the previous night & woke up at 7:30 in the morning. I told a visiting friend about this, & she said “Tamami, but 4am is not ‘night’, it’s already ‘morning’! What-on-earth..?!”. Lol, yes, perhaps, but I didn’t feel the lateness atall! I was buzzing, working on my book! And it is just so exciting, ideas just keep pouring out & I know exactly what to write! Like the crisp blue sky, everything is clear for me on what to do. If only time allowed, I would work on it day on end! And besides, I didn’t sleep much prior to this book writing anyways! It’s just the way I am. On average I probably slept 5 to 6 hours or so a night, often going to sleep around 3am. There’s something I love about the undisturbed hush of the night, it’s as if suspended in time. I often read or potter around in the kitchen & ofcourse also do my blogging. And now that my book project has fully commenced, it’s the night-times that I must really work in, what with day-times being fully booked with family & market work, it’s the only reserved slot of time I have. The stall’s doing great by the way. Sales are on the up for definite compared to last Winter. (Phew!) And it’s still cold enough to have a decent sale on the truffles & hot chocolates. The market itself feels busier than ever before & this week was a perfect example of so. The last two weeks I deliberately produced less cakes so that I can finish slightly earlier on Friday night & also go home earlier than usual at 4pm on the Saturday to conserve energy to work on my book. Unfortunately it also meant no lemon drizzle cake the first week. I disappointed a few customers though so I just about squeezed time to make two for this week. But the situation is that a cake has to leave my line-up, & it’s either gotta be the lemon drizzle or the baked cheesecake (aghast!) Which one should go? 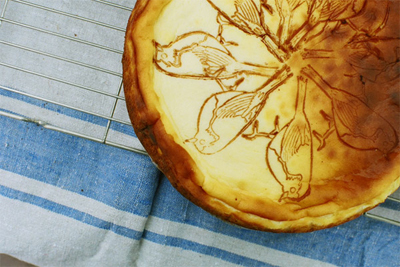 Sale-wise, the cheesecake is perhaps less popular, but the look of it with the bird stenciling does stop people on track… Sigh…, which one should it be? It’s so difficult! I wish I were there on that beautiful day at the market! Take it easy on the book so you don’t burn out of steam! Also I say keep both cakes. maybe you could experiment, taking turns to omit one cake & keep one and then vice versa. How exciting, Tamami! It’s like Spring is blooming your book! 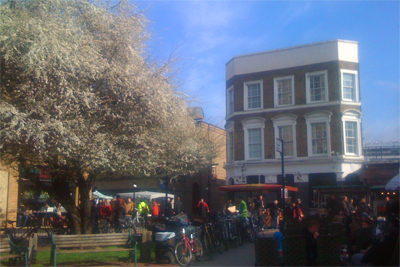 I love the picture of the cherry tree in flower and remember fondly our visit to the market last summer. Looking forward to updates on the cookbook! Cheers! Diane, I’m glad you like the picture! The lens on my iPhone is so murky, I wasn’t quite sure if I should use this pic! Today we have a very similar weather, in the shade it is very very cold still, but atleast it’s sunny & the colours appear brighter! It does lift people’s moods it seems!! Cheers Diane!! gorgeous blue sky! i’m one of those ‘7hour’ sleepers ;) if the cheesecake keeps better in cooler weather, maybe a more seasonal approach will work out–lemon when warmer, cheesecake when cooler. glad you’re enjoying the book-writing. After the harsh winter, I’m so happy that you finally have a beautiful spring day for the market! I love the photo too – the mistiness somehow makes it look even more spring-y. Hi Tamami, I’ve been reading your blog for ages now, over here in Australia,but this is my first comment. Congratulations on the book, hopefully we’ll be able to buy it off the site when you’re published? Can’t wait. Those cheesecakes are so pretty, would be sad not to have them, but the lemon drizzle sounds delish, good luck deciding!! oh no, i’m yet to visit your stall and will miss these… taking turns would be a good idea if it works for you, and will also motivate me to visit more often, hehehe. ;) Good luck and congratulations about the book! Lovely picture. Here in Ohio we have exceptionally gray winters, so I can appreciate how happy it makes one to see the sunshine and blossoms!! I am happy for you that the ideas are flowing and the book is starting out well. I am a night person also, so I understand that sometimes thoughts are clearer then. Good idea to alternate the cakes to save some time. Or, since your lemon cake is so popular, maybe some type of extra decoration could be applied to the top of that cake to keep the eye-appeal, just-gotta-stop-and-look-at-this-stall effect, just in case you do decide to drop the cheesecake. such a strong quake! hoping friends & family are OK.
petoskystone, it’s truly devastating. I feel so tearful watching the footage on TV. My relatives are all fine. They don’t live in Sendai, nor anywhere close. I can’t get in touch with one friend, & another friend’s mother is also unavailable to reach. pleased to hear you have been able to contact nearly everyone!